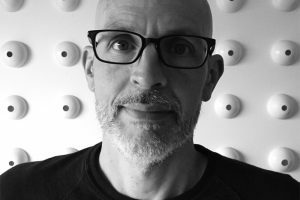 Maurice Meilleur is Assistant Professor of Graphic Design in the Department of Art at Appalachian State University in Boone. He participated The Phaistos Project — Forty-five Symbols in fall 2016 with the class Sign/Symbol/Image—a course on design semiotics. TPP45S What originally made you want to become a designer and how would you describe your education (in or out of school)? MAURICE MEILLEUR My background is in political science; I have a PhD from Indiana University. My studies were in political theory, primarily political epistemology: the political significance of truth and inquiry, of knowing how we know, of how we make meaning of experience. I was and am also a bibliophile; I became interested in typography while I was working on my dissertation, and taught myself as much as I could about it from books, and online fora like Typophile and the now-defunct Speak Up. My fascination with type spread into an interest in information design, then graphic design generally; then, at a certain point, I realized that I was more interested in design than in political theory, and specifically in design research and education. I was advising and teaching at the University of Illinois in Urbana-Champaign, so I applied to the graphic design MFA program there in 2012, was accepted, and finished my degree in 2015. TPP45S What made you being interested in teaching? MAURICE MEILLEUR I’ve always been interested—I think over the years I’ve realized I’m more interested in research and writing, but I always wanted to teach, just as I did in political science. I’ve had some great teachers in my life, and I know how much difference it makes to have them—I still remember things teachers told me more than forty years ago. The right comment at the right time, a book suggestion, an offhand remark that reveals a truth that has nothing to do with the subject under discussion, the example you set at a public meeting—they can make all the difference for students. It’s humbling, really. TPP45S In which class did you assign the Phaistos Project (program, discipline, level, etc.)? MAURICE MEILLEUR I introduced the project to graphic design BFA students in their third and fourth years, anywhere from graduating that semester to still a couple terms away. The course was called Sign/Symbol/Image—a course on design semiotics—and I’ll be teaching it again this fall, with the same kinds of students, who will be submitting their work to the Project. TPP45S What was your initial response looking at the Phaistos Disc? Did it raise any questions? Did it inspire pedagogy and preparations for your class? MAURICE MEILLEUR What we mainly talked about in class regarding the disc was that we obviously don’t understand it even though its creators almost certainly meant to communicate *something* with it. We make assumptions, we’d like to think informed assumptions, but we don’t have enough context or anything resembling a Rosetta Stone to give us any kind of firm evidence to work with. We don’t even know whether the symbols on the disk are a script or something more like icons, or even just decorations (and decorations also communicate things, and how do we recognize writing anyway?). If they are a script, what kind of script it is: phonographic? semasiographic? some combination, or something else entirely? Thinking about the disc and this project led (along with other ideas informing the course) to two other course projects: one on telling stories without words (we used fairy tales), and one on how you would transmit important information to people in the far future, at least as far ahead of us as we are now from the Minoans 4000 years ago. How do you achieve clarity and avoid misinterpretation, when all the tools we rely on to do that (context, shared experiences and languages, and so on) aren’t available? And having said that, is it really so easy for us to do this even in the projects we undertake for people in the here and now? TPP45S Could you describe the biggest challenges for your students during the process? MAURICE MEILLEUR Many of the students had never tried to design a system of anything from scratch, formally or otherwise. 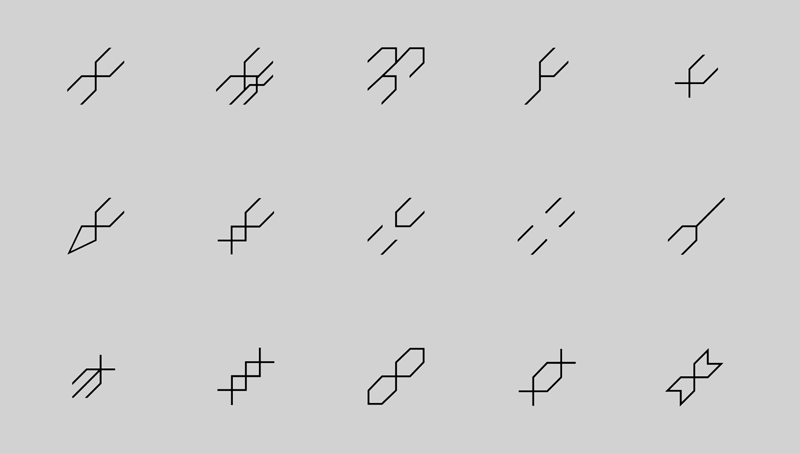 It was important to look at lots of examples of symbol systems, good and not so good, to get a feel for what makes a system look like a system. Choosing what they were interested in within the bounds of the brief was not a problem, but narrowing down what kind of story they wanted to tell with their symbols was a challenge. 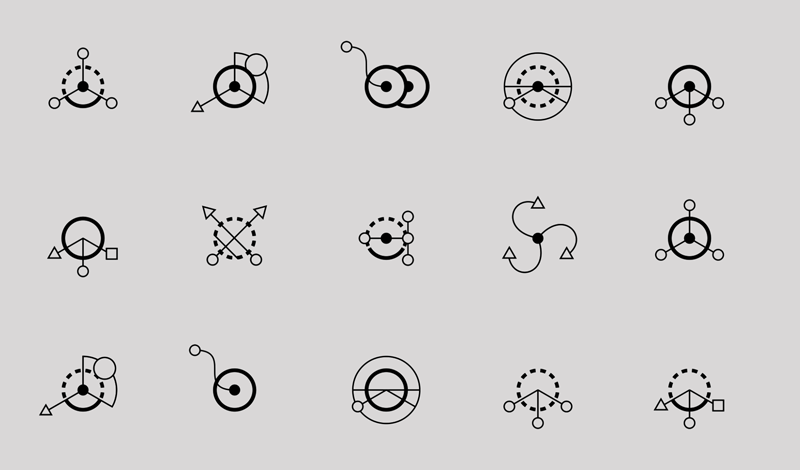 Also difficult was deciding how the symbols would be used in the story: things, events, places, ideas? Were they going to be more like words in a sentence, or labels on objects? Were they going to tell *us* to do (or not do) something, tell us about what other people (or animals, or things) were doing or having done to them, tell us about something, associate or distinguish things, speak declaratively or hypothetically or counterfactually? And no matter what you decide, how do you represent concept with form? Talking about existing examples helps. It was good that the systems we encounter all the time already have so many problems one can find: for example, that so many systems distinguish between ‘male’ and ‘female’ people, and use ‘male’ as the default agent. But many of my students were working with concepts a lot more complex than ‘bathroom’ or ‘service desk’ or ‘fire exit’ (which are already complex enough) and it was a real challenge to find ways to symbolize them in relatively unambiguous ways. “Changing Cities” developed by Cole Finch in the class Sign/Symbol/Image taught by Maurice Meilleur fall 2016. TPP45S What were the most positive and beneficial experiences of your students? MAURICE MEILLEUR First of all, they were impressed by the publications and the website submissions—they saw it was all student work and it really fired their imaginations about what they were capable of doing themselves, which is pedagogical gold, right? It gave them a goal they saw value in and some assurance that it was within their ability to reach. The experience of taking a prescribed theme and interpreting it in their own way was another great aspect of the project; they had to think and do research and find out for themselves what they knew, what they thought they knew, and what they didn’t know about a subject they had chosen to spend time with. That is an aspect of design you can’t replace with software or automated processes or templates, the process of inquiry and discovery and imagination. Personally, many of the students used the project to work out questions or issues they were dealing with all the time in their own lives: gender and sexual roles and identities, health and illness, their relationship to technology or their environment. And they got a lot out of sharing their work with other students: crits were so straightforward, easy to sort into responses to formal and conceptual issues, the feedback so relevant, because the process is so immediate: you say you’re telling this story, in this way, and I either see it or I don’t, and you can’t really argue with that! TPP45S Were there teachable moments? MAURICE MEILLEUR This project was a good opportunity to reinforce lessons about what it means for a series of icons, symbols, letters, shapes generally to speak the same formal language, and a language appropriate to where it will be applied and encountered (size, resolution, color, contrast, and so on). Students had to spend a lot of time refining and revising, in the process abstracting and thinking of content and combinations: icons and symbols are not picture books, and they work in concert with each other. How do you design a set of forms that can teach the people who encounter them how to use them to decode the information you’re trying to pass along, without having to struggle to see them belonging together, or sort through too much noise? Will the same system work for anyone, anywhere? What assumptions do we have to make about what we share with our audiences to even get a project like this off the ground? Because students had a limited set of symbols to make, they had to make choices—what sort of story did they want to tell, about what, to whom, with what effect?—and we had many good conversations about how to go about making those choices. Students learned (again!) that while there are some clearly wrong ways to respond to a design situation, there are many, many more ‘right’ ways to respond—but none of them are right for everyone, for any purpose in any circumstances, and no one can absolve the designer of the need to exercise judgment. And when your audience says that they don’t see what you’re up to, you learn that there’s no point in arguing with them—you go back and fix things. That’s a great basis upon which to have a conversation about interactions between designers and clients and audiences generally. TPP45S Do you have any recommendations for peer professors who would like to integrate the project into their class? And we looked at all kinds of symbol systems: the AIGA symbols, various symbol fonts like SymbolSet’s, Emigré’s Poppi, FontFont’s Dingbats, and all the uploads on The Noun Project’s site. In all these cases it’s important to spend as much time with form as with content and meaning. Students have to design a system that teaches its users how to work with it, which means setting up the game the symbols play clearly, and form is a huge part of that. Talk through with students what kind of stories they want to tell around the theme they’ve chosen, how they imagine the symbols being used, what they have to represent to make the stories work, and so on. Otherwise students won’t know where to start, or they’ll get overwhelmed by all the things they could try to symbolize. Get them asking you and each other and themselves questions constantly about what they’re doing. Be prepared to give students extra time, and if you’re going to grade the project, keep that evaluation separate from the submission process; maybe do the class project early in the fall, then evaluate and return it, and leave a month or more between then and when students/you have to submit their 45 symbols officially. That way they have time to respond to your and their peers’ feedback, and revise/edit/etc. “Genomics” developed by Sean Burgess in the class Sign/Symbol/Image taught by Maurice Meilleur fall 2016. “Genomics” was one of three winning projects of the open call 16/17. TPP45S Knowing that your students will be active members of the creative community for the next fifty years, what are the core values, competences, skills or ethics you would like them to build during their undergraduate/graduate studies? 1 Research. Students have to learn how to learn for themselves, how to ask really smart questions and track down answers, to not settle for stock answers and assumptions and *uncritical* acceptance of convention and tradition. They’ll have to compromise because they’re human and working for and through other people, but they need to know that’s happening. I mean research in every sense of gathering knowledge, including thinking of and choosing design methods as tools that put you in a position to learn what you need to know (including participatory and community-based methods, where appropriate). 2 Semiotics. Students typically are good at picking up making skills (including working with applications and interfaces and output devices) and learning the contemporary rhetoric of design, and on the job they’ll be forced to learn (if they don’t already know) at least something about user experience and human factors. But I think that Steven Skaggs is right: that without a theory of design based in semiotics—the study of signs, of how meaning is encoded in and decoded from form—graphic design is going to remain a kind of ‘folk practice’: a tradition of stories and learning through repetitive imitation of masters and heros, immersed in a world of magic where things just sort of work without our being able to really explain why. 1 and 2, by the way, are invaluable to your ethical judgment as a designer. I can’t tell students what their values should be—they have to choose them for themselves—but a good grounding in design research and semiotics will help them make more informed and thoughtful judgments about the work they encounter, make, and are asked to make by others. 3 Coding. Students should learn at least the rudiments of coding, enough for them to understand its potential and limits and what’s at stake in doing it right. This is because, first of all, the days of many clients paying for bespoke design are already passing. More and more design is going to be done by users themselves through templates. Someone is going to have to build those templates, and know how to build them well and maintain and update/upgrade them. Second, right now designers are pretty chained to software that makes often unjustified and even invisible assumptions about how design is supposed to be done and who is supposed to do it. Adobe’s suite for example is built around tools that are a lot about studio design contexts and production, and they make it costly for designers to iterate, speculate, and just play. Even if you take advantage of the limited scripting access Adobe provides, you still have to adapt your practice to the tools, and you can’t as easily adapt the tools to your practice. The more you learn to code, the more able you are to fashion your own tools and design your own design process. You can become a better, more thoughtful and engaged designer, and offer the people you work with and for something a template can’t replace. TPP45S What are you currently fascinated by? This could be, for example, a book, an article or a designer/artist inspiring your teaching and design practice. MAURICE MEILLEUR I’m writing a journal article and book proposal on the principles of modular scripts, so I’ve been spending a lot of quality time looking at very cool archival materials, reading material about and by about designers like Josef Albers, Wim Crouwel, André Gürtler, and Jurriaan Schrofer, and doing a lot of Python coding to recreate and animate their script designs. Outside that, I’ve just run across Steven Skaggs’s FireSigns (MIT 2017), on semiotics and graphic design, which will wind up being the conceptual basis of the next iteration of my Sign/Symbol/Image course. And I’ve been reading recently a lot of Richard Hollis, a British designer and author. Hyphen Press just published a fantastic book on his design work with the Whitechapel Gallery in London, and Occasional Papers last year released a revised edition of a collection of his essays, but he also has published a book on Swiss graphic design, and he has a great short history of graphic design out (2ed Laurence King, 2002). (One place where you might have seen his work is the book for John Berger’s 1972 Ways of seeing, which Hollis designed.) Hollis has such a great take on design history—such an acute observer of designed materials, and he pays close attention to social/political and craft/technological questions as well as aesthetic ones in interpreting design. His take is that graphic design (as distinct from visual communication) doesn’t really exist until the role of the designer is distinct from that of the producer, which isn’t possible until technology allows you to concentrate control of all aspects of design in one place—that starts with photography in the nineteenth century and photolithography in the first part of the twentieth century, and really comes into its own with digital desktop publishing and computer-to-plate printing in the 80s and 90s, where the process of design is nearly completely independent of the process of production. 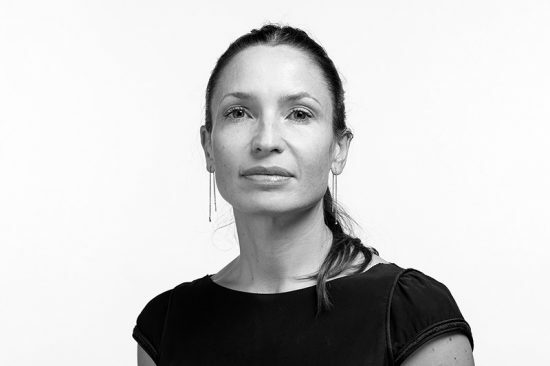 is a recovering political theorist turned graphic designer and design researcher and writer. He completed a PhD in political theory from Indiana University Bloomington in 2004, and earned an MFA in graphic design from the University of Illinois at Urbana-Champaign in 2015. 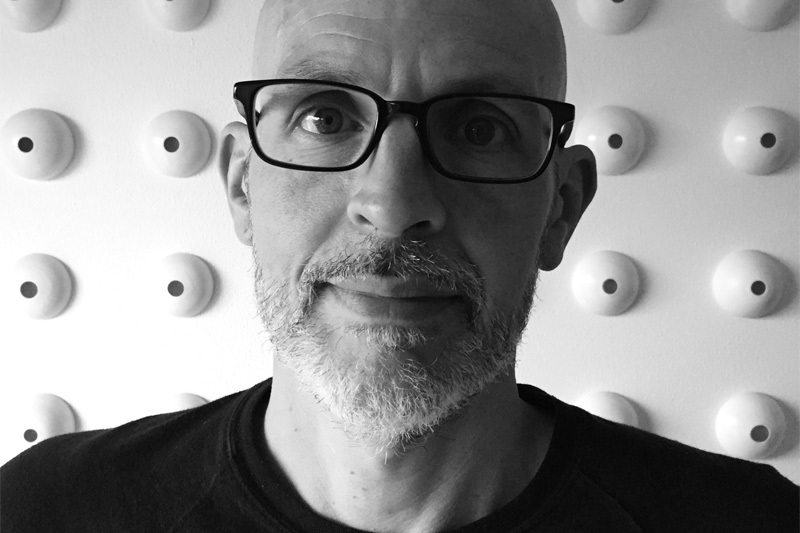 Presently he is an assistant professor of graphic design in the Department of Art at Appalachian State University in Boone, North Carolina, where he teaches and studies typography and design semiotics and methods. Maurice has contributed numerous type and book reviews to Typographica and Fonts in Use, and he’s writing a book on the principles and history of modular scripts. His experimental modular typeface Kast was a jury finalist in the Society of Typographic Aficionados’s 2016 protoType competition. He’s developed Kast into paper, photographic, print, and digital artifacts, and begun to explore digital animation using Python and Drawbot as part of a larger investigation into typographic representation and parametric/algorithmic/generative formal systems. The Bachelor of Fine Arts in Graphic Design is recognized as the definitive professional degree in the field. It implies a thorough and comprehensive academic experience focusing on the development of skills, concepts, and sensitivities that are essential to the education of the professional designer. The BFA degree in Graphic Design consists of 66 semester hours in Art Studio and related areas and 12 semester hours in Art History/Criticism and allows students to take a mix of both prescribed and elected courses in art, concentrating on individual strengths and interests. All graphic design majors must submit their work to CANDIDACY PORTFOLIO REVIEW for acceptance into the BFA Graphic Design degree track.